I can’t tell you how ecstatic I was when the doors of Target opened all across Canada. Target has made shopping so much more easier for me as a busy mother that still looks for good quality items, and for some miraculous reason, this is the one large retail shop that my 4 year old seems to never have a tantrum of some sort in *knocks on wood*. Must be the Red! Or the fact that the target logo can be quite hypnotizing. Well done, Target. Have you been to your local Target yet? Mother’s Day is fast approaching and there truly is no better place to get so many wonderful gift ideas at fantastic pricing than at Target. 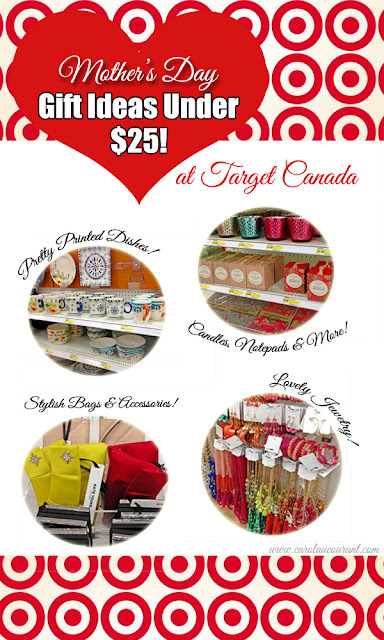 Here are some of my favourite gift ideas under $25 spotted during my most recent trip to Target. Kate Young is one of my favourite Target Designer Brands featuring chic and on-trend items for every savvy and stylish woman. These gorgeous clutches and accessories would make lovely gifts! 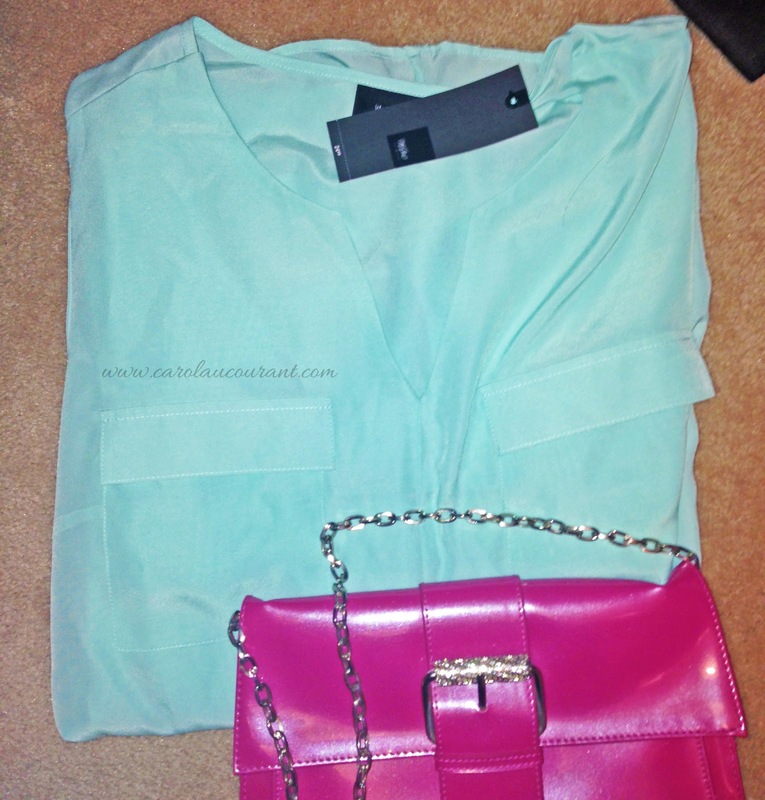 Some fab finds under $25! And if that wasn’t enough pretty for you, their selection of jewelry pieces are to die for! They’ve got a variety of jewelry to suit all taste. These ones are perfect for Spring/Summer and will add the perfect touch to Mom’s wardrobe. They start at $5.99 with most under $25! If she loves bags, they have quite a few under $25. These Merona Clutches (seen here in sand colour) are only $24.99. They have deals all the time so watch out for more discounts! These are super lovely outfits! Many of their blouses, pants, tops, dresses from their amazing line-up of designers including Kate Young, Massimo, Merona and more are priced under $25! You will definitely find something that Mom will love! If you are looking for something for an Expecting Mom, they’ve got a gorgeous collection of Maternity wear too. What woman doesn’t love cardi’s? They can change up a wardrobe in an instant. I personally love cardigan’s and these Merona ones in an assortment of appealing prints will make any woman happy. Target sizes range from XS to XXL. These cardigans are priced so well at only $24.99! If you know a mom that loves taking pictures and proudly displaying them as much as I do, these charming selection of frames would make a great gift. Prices start at $5.99 with the artistic hanging frames at only $24.99. Scented Candles are never a bad gift idea. Well, for most that is. I am addicted to scented candles and personally find them to always make for a lovely gift idea. This collection I came across including Diffusers, Scented Candles, Vases, even notepads are simply adorable. Prices start at $9.99. And how about pairing a candle with a comfy throw? I know the weather is getting warmer, but every woman loves curling up at night underneath a cozy throw blanket. They’ve got some throws in different colours and prints available under $25. Perhaps even pick up a book in their book section and a box of tea too? Perfect combo! I’m weak for pretty prints so when I saw these stone dishware items starting at only $3.99 (microwavable and dishwasher safe) in an array of dainty designs I knew I just had to have it! And yes, I did leave this trip with a few of them. For the mother that enjoys a slow-cooked, delicious meal and not much time on her hands, these slow cookers are a fantastic gift idea under $25! Check out that white and light blue damask printed one. Super cute! Perfumes tend to be a tricky gift purchase as not every person enjoys fragrances and of course, everyone has their own scent preference. But if you know that mom well and know what she will love, I’m sure you’ll find a great perfume to suit her taste with the collection they have. There are quite a few under $25! If perfume is not her cup of tea, they also have bath and body product gift sets and/or make-up gifts for under $25. Whatever her taste or style, the wonderful thing about shopping for a Mother’s Day gift at Target is that you will leave with the right gift because they have everything you need. While you’re shopping for a gift, why not pick something up for yourself too? Look what I left with. This pretty pastel green blouse is light, airy and a great piece to add to my Spring/Summer wardrobe to be mixed and matched. Disclosure: “I am a member of the Collective Bias® Social Fabric® Community. This shop has been compensated as part of a social shopper insights study for Collective Bias® #cbias #SocialFabric. Slow-cookers are a life saver! They make the best roasts ever, if we didn’t already have 2 that would be my top choice for my mom! Still need to check out Target! I am so looking forward to them opening here in Montreal. So excited that target is finally in Canada. I have been too many times to count. I will have to check out your mother’s day finds, my mom is a huge candles fan. lol. Great choices! You take awesome pictures, the colours are so vibrant! Our Target opens here this summer, can’t wait! Wow you found some fantastic Mother’s Day gift ideas at Target. Love you ideas for pairing some of them up too! Really love the gift ideas here! Thanks! I never thought of the candle, throw and book combo. Those are the little things that Moms everywhere would love! And even the cute dishware and clutches! Target shopping trip in store! Those are pretty pieces you got. There are so many Targets that opened around me and it’s much more convenient now. Can’t wait for target to open up in Calgary. It looks there are some awesome gift ideas for mothers day especially the candles and cardigans! Ooo nice finds! I still have yet to set foot in a Target, but I’m drooling over these gorgeous steals! I’m from the States and just moved to Canada so it’s nice seeing the familiar red target logo over here! It’s one of my favourite shops. Great collection of Mother’s Day gift ideas; you’ve given me some good ideas! I was just there last night and I love their collection of clothing, especially the Nygard and Mossimo. Always tough to leave with one item at Target! LOL! Thanks for the ideas. Those candles and notepads are pretty! And so are those cardigans!